One of the most annoying things about breaking your phone is having to go somewhere and wait in line to get it fixed. There’s another, unexpected option now for iPhone users who have shattered their device’s screens or need help with a dead battery: satellite provider Dish has launched a new repair service that sends a technician to wherever the customer is. Right now, the house call service is limited to the iPhone 5, 5s, 5c, 6, and 6 Plus, though it’s expected that Dish will add more devices — likely Android phones — to the list in the coming weeks. Here’s how it works, starting today, according to Dish: customers request an on-site screen fix or battery replacement through the service’s site, and Dish will send a technician who will use “high-quality replacement parts from respected third parties” to complete repairs. Customers can schedule an appointment in two-hour windows for any day of the week. Depending on when you book a tech, you can either get same-day or next-day service. The techs will go to a customer’s home, office, or the gym. While the customer waits, they can check their tech’s name online, see a photo, and track their vehicle as they make their way to your location. “Fixing your phone shouldn’t mean losing your phone for days on end, so we come to you — whether you’re at the office, the gym or even the coffee shop,” John Swieringa, Dish’s executive vice president of operations, said in a press release. 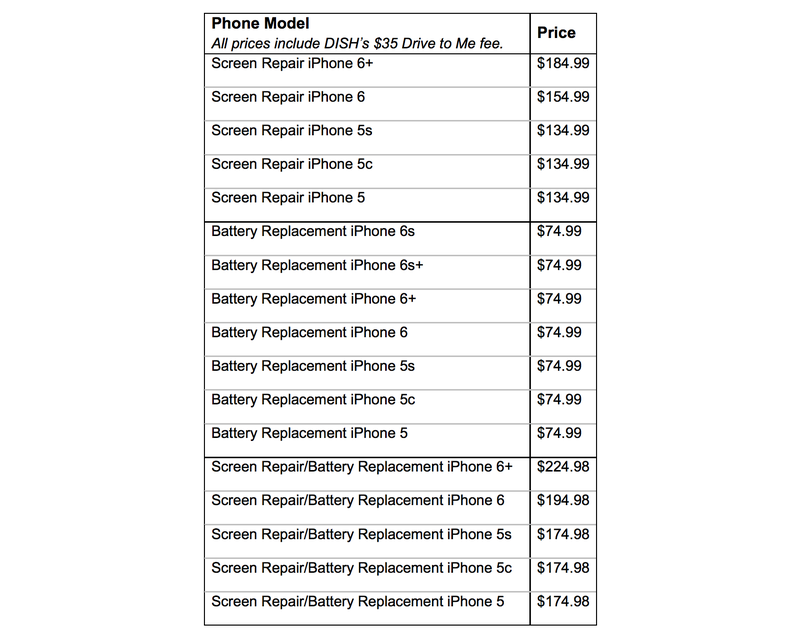 Prices start at $74.99 for a battery swap and range up to $224.98 if you have to fix the display and battery in an iPhone 6 Plus. Again — the only services a tech will perform are to fix a screen or battery, so if you’ve got liquid damage or anything else going on, you’re out of luck. If something happens to your phone afterward that’s related to the repair the tech performed, Dish has a 60-day warranty to cover any subsequent fix needed. Previous Court Rejects Twitter’s Transparency Lawsuit Against Justice Dept.